One which is worthy of note is fluoride intake. Due to environmental factors, one could come in contact with it in drinking water. or should we start another behavioral communication against the use of tooth paste because we know sodium fluoride is one of the key compound of some toothpaste. should we start a campaign on using chewing stick rather than toothbrush? Some research have it that chewing stick has revealed parallel and at times greater mechanical and chemical cleansing of oral tissues as compared to a toothbrush. Food and drink intake also causes teeth coloration. I would not discourage anybody from eating and drinking. food/drinks like tea, coffee, apple, potatoes, -fruit/veg, etc causes teeth coloration. Other causes could be sickness, using certain medication, genetic factors could but nevertheless, the other bad lifestyle which causes teeth coloration which is smoking. Tobacco is made of two major substance which is tar and nicotine. Nicotine is naturally colorless but becomes yellow when mixed with oxygen molecules. tar is naturally dark. The enamel which is the hardest part of teeth contains some pore which the smoking of tobacco (cigarette) could attract the nicotine and tar and cause discoloration to the teeth. Please note that it does not affect the underlying of the teeth, it only affect just the enamel. People who smoke or have stopped smoking have this stains and it's a easy way to detect people who smoke or had smoke before. But thankfully there is a professional whitening treatment that restore the teeth back to it's sparkling white color. 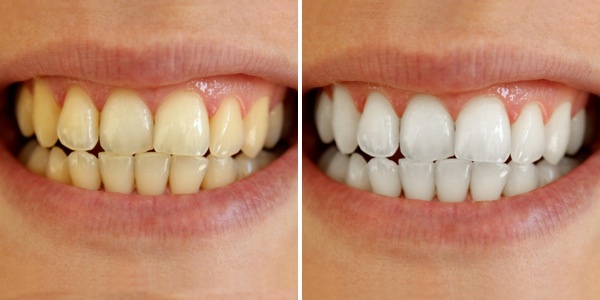 The treatment is perhaps the best remedy to teeth coloration. I cannot tell you to stop eating and drinking. Even if I tell you to quit smoking, the damage to the teeth had already been done. The treatment is called Alta White and it removes the long worrisome stain from your teeth in just one wash. The treatment is not manufactured by me but when I see something that works, it is good enough to recommend it. Click on the link above to understand how it works. Leave me a comment let us discuss if the treatment could result into any side-effect.